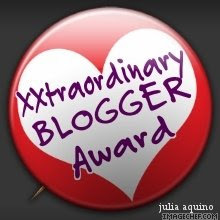 Pinay WAHM: Xxtraordinary BLOGGER Award!!! I was about to sign off for the night. But I thought of checking my Teacher's Corner blog. Surprise surprise....Mommy Emma left me a note on my tag board! I got this award from my other blogger friends and I posted it in my Teacher's Corner. But since this one is from Mommy Emma, it deserves its own space and acknowledgment in here. Thanks much, Mommy Emma...like I said in my message in your tag board...I'm super touched. Really!! !